As you said, sports do a great job of using infographics. 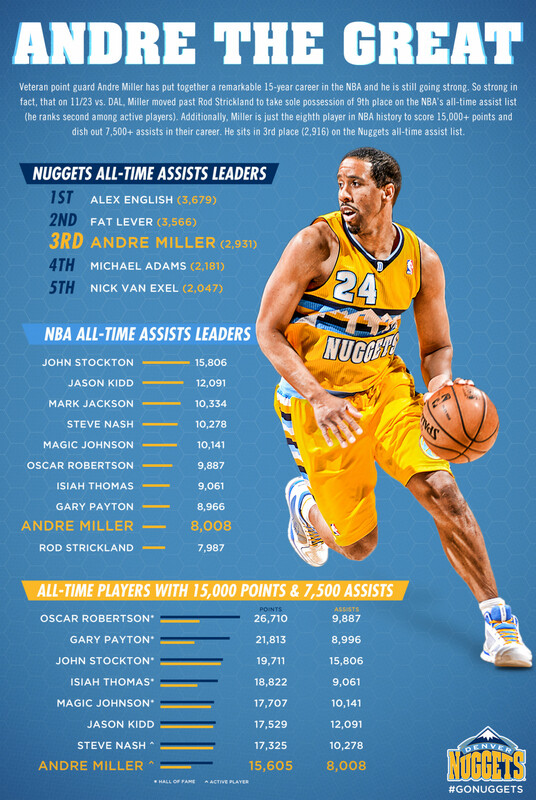 I like how this infographic is simple and is coordinated with the colors of the Denver Nuggets. The title also doesn’t need much more background because you can see that Andre is listed with multiple hall-of-famers and future hall-of-famers. I do think it is also worth mentioning that they used the team colors for the text and background. This makes the poster much more interesting than if the poster was black and white. They also use an active picture of the player instead of on where we is just standing still. I am inclined to agree that the image does a good job bringing out the important information, or at least the information that the author wants to highlight. Additionally the colors help visually by showing colors related to the team. Finally, his pose shows the action and work that he puts towards his team, further showing his dedication.